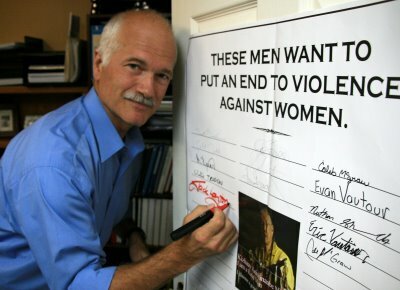 I am so sad to hear about the loss of Jack Layton, a man who DID take upon himself the woe of the people, who fought for those people, and who had a vision for Canada that included people who live with challenges of all sorts. Whether you agree with his politics or not (and, full disclosure here, I do! ), you’ve got to admire Jack. He was a scrapper, but not a dirty fighter – he stayed true to his ideals, even when faced with opposition from without and even from within his party. He was honourable. As politicians go, he had heart, integrity, and courage. We are going to miss him so. I had the pleasure to meet Jack and Olivia when I was briefly intensely active with the NDP. He was charming, Olivia even more so, but you could not doubt his conviction. I like that in a person. He knew what he wanted to see, he worked tirelessly to get it. Along the way, he listened to people, took their advice, grew into a statesman, adapted. Some people faulted him for that. I know those old-time socialists, who feel that even speaking to a non-member was sacrilege. I’ve met them. They are intransigent, as closed-minded as the right-wing that is in charge of the country at present. One of the things that impressed me most about Jack was that he was able to adapt, based on what people told him. He was able to clearly show a vision for the country, based on what he had learned. We’ve had so few leaders of late. Pierre Trudeau, Ed Broadbent, maybe Frank McKenna. What we’ve been dealing with are managers. I was one of those once, and that’s not what is needed to lead a country. It involves endless miniature steps in the dark, with no idea of where you are going, justifying every inch forward with forms in triplicate while lying to those above you and below you in the chain to make yourself and your team look good. It almost killed me. It is killing Canada. I had hope, soaring hope, when Jack was elected Leader of the Opposition. I thought, finally, someone with the ability to see the big picture, to push for it, with the strength to make it happen. Unfortunately, the battle to get there seemed to exhaust his strength, encourage the cancer to sneak in hidden pathways. I’m so glad he was able to see his triumph, but so destroyed we won’t have a chance to see him grow into it. And I am in fear of the tyranny of the Harper Conservatives, their false ways, their hatred for knowledge and science and progress and people, their love for money. I know there are other leaders in the wings in the NDP. I’m hoping they have the courage to step forward to try to fill Jack’s place, though it will be difficult. We need a strong opposition now, more than ever. It’s not enough to just be sad, to wish for things to be different. I take up Jack’s challenge, in honour of his sacrifice. It’s time to get back into the political ring, to fight for what we need for the least of us. Or even the middle of us. Or at least to CARE about where we in Canada go, with this great country of ours. What about you? We’re sure gonna miss you, Jack. So well said. Thanks for putting into words what so many of us are thinking and feeling. Very well written. Thanks for sharing your memories – this is both deeply personal and inspirational for all.